Get Your Bill White In Disguise Cut-Outs for the Hands Off Texas Rally! President Barack Obama is coming to Texas Monday to raise money for the Democratic Party, and Bill White is doing everything he can to hide from Obama's "kiss of death." 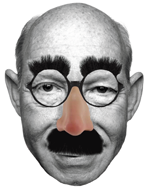 Americans For Prosperity has designed a humorous Bill White in disguise mask. Download it here and bring it to the protest tomorrow! Download and print this graphic, cut it out and attach it to a popsicle stick or hand fan and bring it to Monday's rally at the capitol. And post it on facebook, so Texans will be able to spot Bill before he gets past us. While President Obama is coming to Texas on Monday to raise money for the liberal machine in Washington, D.C., we're going to be at the Capitol in Austin to serve as a welcoming committee-of-sorts. Rather than roll out the red carpet for the Spender-In-Chief, we're going to send him a message. TexasGOPVote will be covering the event from start to finish, so check back for live updates!